Years ago I got the idea to try some needle felting. I tried and failed and my supplies collected dust until I passed most of them on during my KonMari purge. And now a few years later, I’m realizing how wonderful handicrafts are- especially ones that can be done with children, and I wish I had those supplies! Oh well, it’s a new day and I have new supplies, and finally had some needle felting success. The secret to my success is to use a cookie cutter as a mold for the wool. It’s so much easier than trying to create a shape freeform! 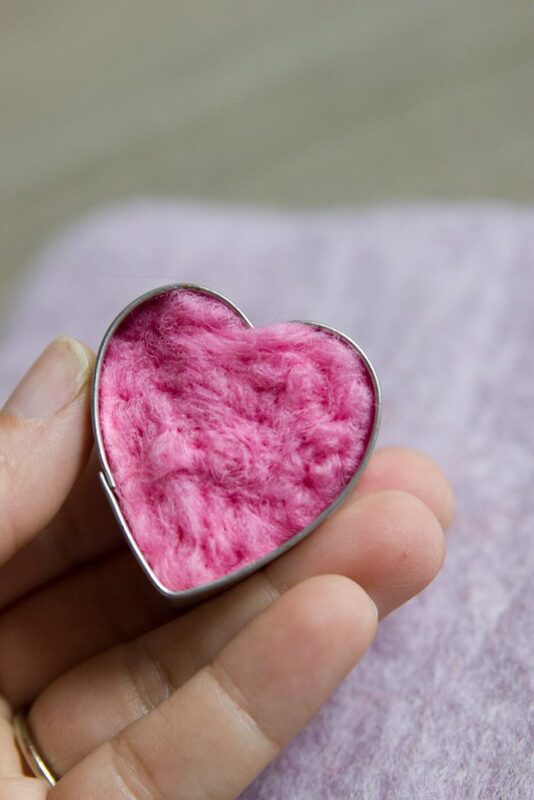 I’ve put together a quick tutorial to show you how we made these adorable needle felted hearts, but you can use any kind of cookie cutter. 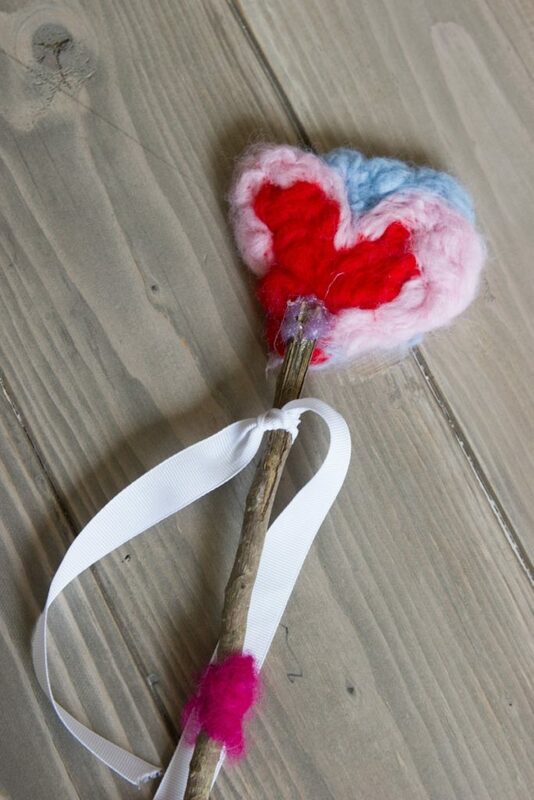 We made these with our homeschool co-op and the children made mittens, hammers, dog bones and hearts. Something for everyone! We had children from age 3-9 doing this handicraft, and even the 3 year olds did great with it. Needle felting requires some kind of padding. 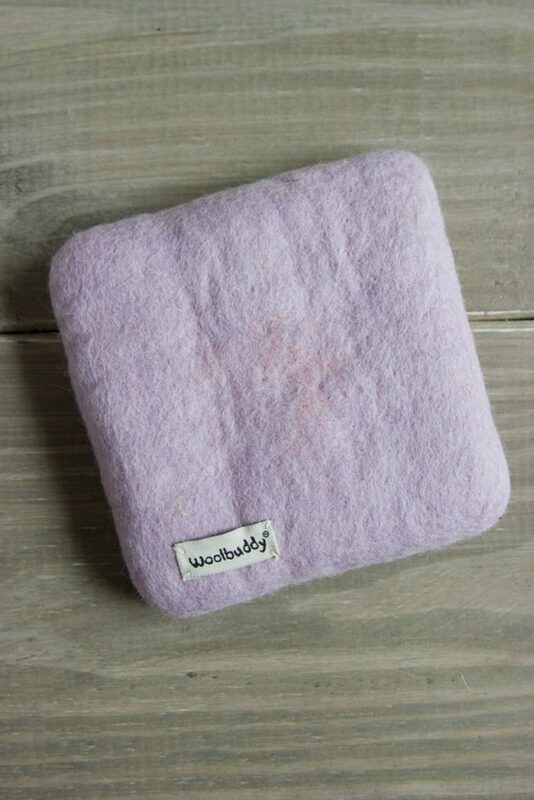 You can find standard needle felting pads at the craft store, but I love this sweet Woolbuddy pad. You can also use a remnant piece of upholstery padding. We cut up a chair pad and used this at our homeschool co-op and it worked great. Choose your color of wool roving and begin to stretch it apart. It’s best to gently pull apart in the direction of the threads. You’ll want a thin layer of wool about the same size as your cookie cutter. Place the wool roving over the top of the cookie cutter. 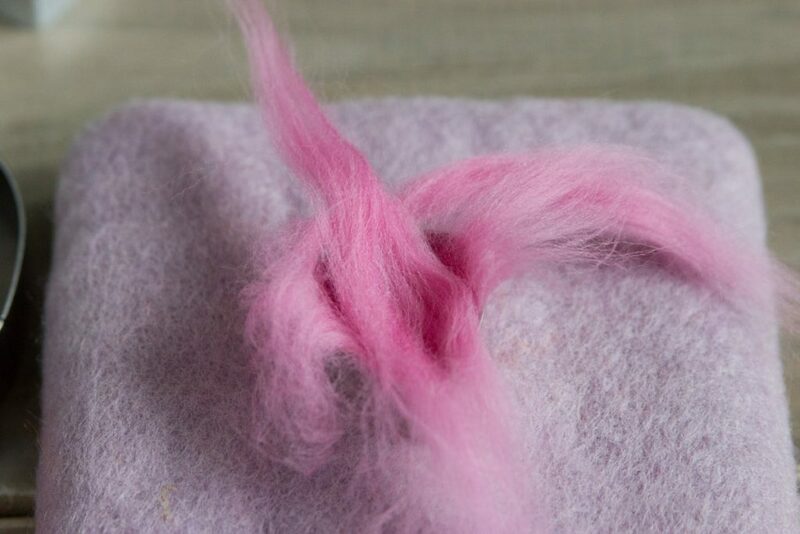 Pull apart another thin layer of wool and lay in across the cookie cutter in the opposite direction of the first layer. 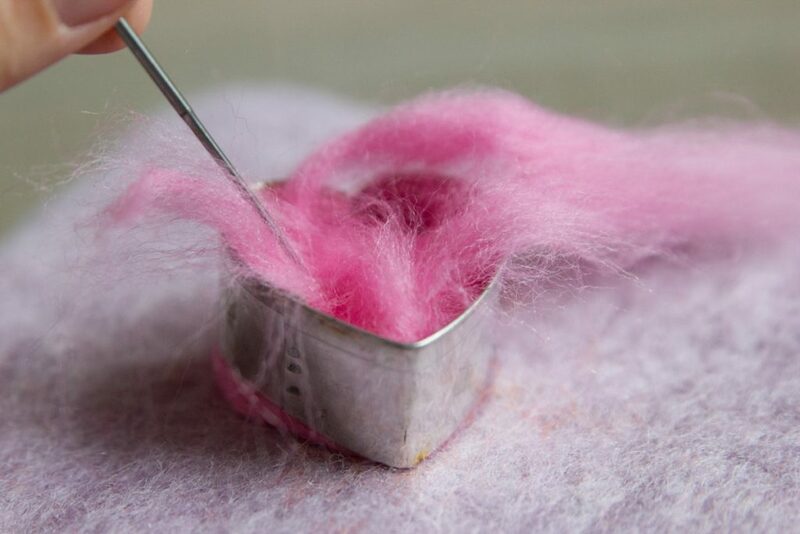 Continue this process until the wool has filled the inside of the cookie cutter using a minimum of three layers. I’m using a tiny cookie cutter so I folded all of the wool into the cookie cutter once I had placed the layers. 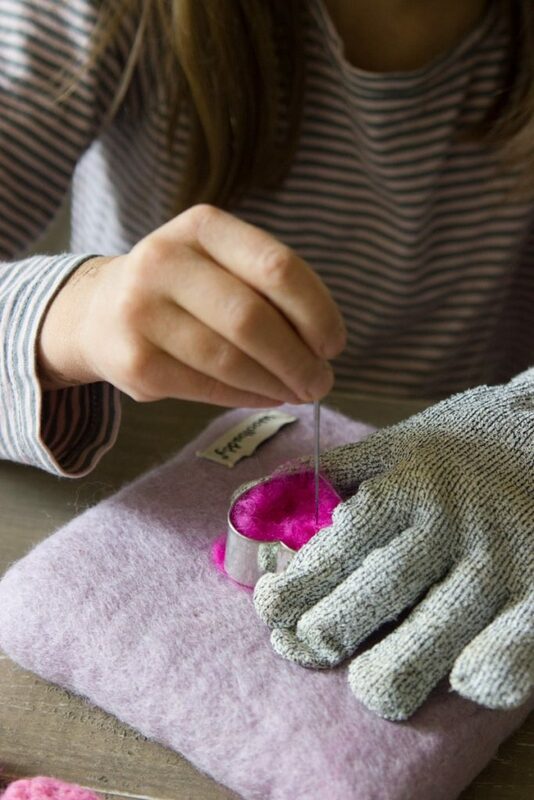 When the wool is in place, use a felting needle to begin pressing down the wool into the pad. Felting needles are very sharp and have barbed tips to compress the wool. 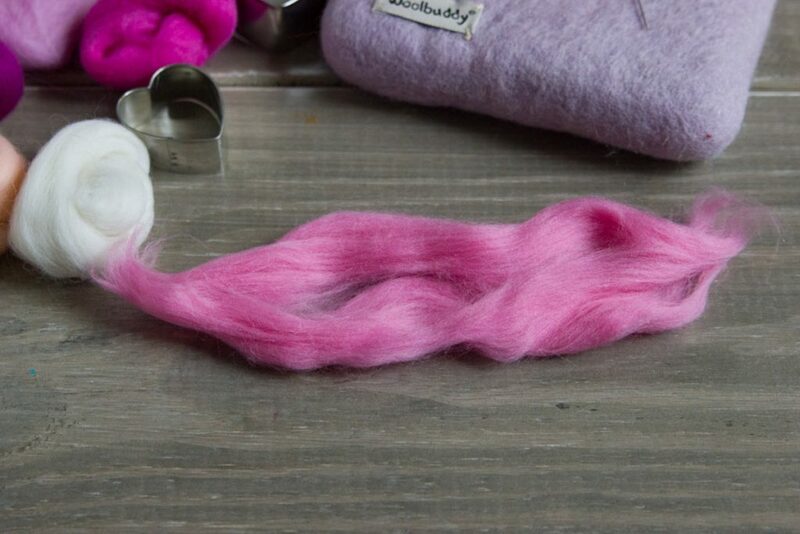 There are tons of options for felting needle with different shaped tips and sizes. 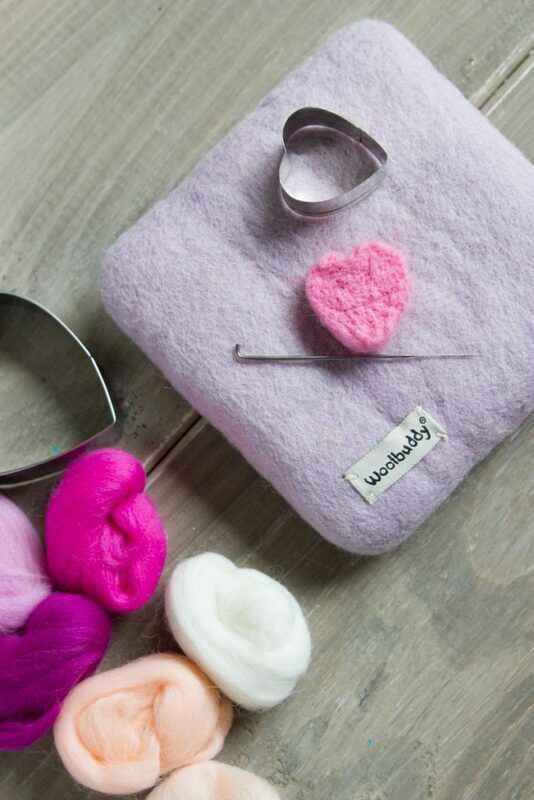 You can also get needle holders or felting pens than hold multiple needles to speed up the felting process. I ordered a basic pack of needles that came in three sizes and it worked perfectly for our needs. 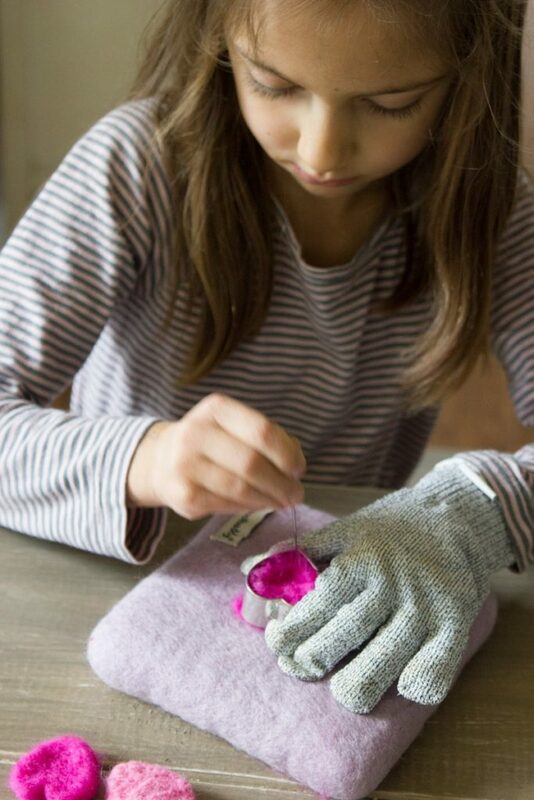 I recommend children use a cut-resistant glove on their non-dominant hand that is holding the cookie cutter. Start poking the needle up and down around the outside edge of the cookie cutter first. Press the needle deep enough to hit the pad, but not so hard as to go through it as the needles break pretty easily. When the wool starts to become compact and the shape looks like it will hold itself, gently peel the wool and the cookie cutter off of the pad. 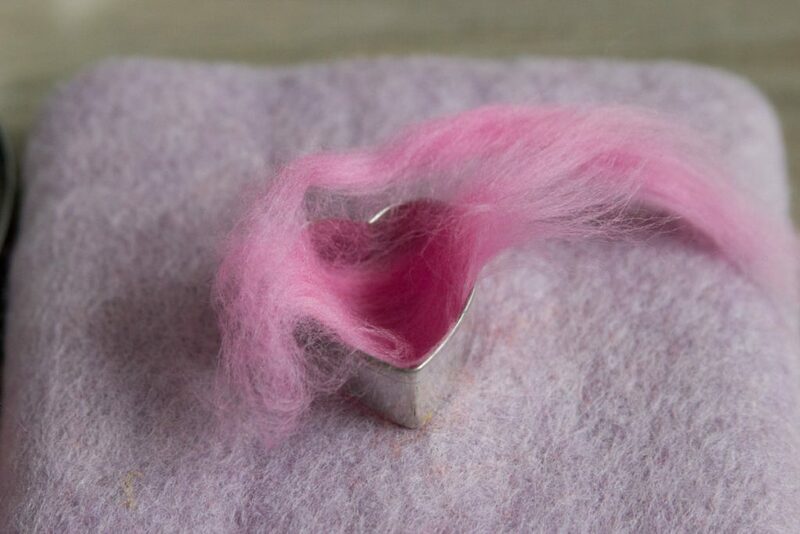 Flip the cookie cutter over and place it back on the pad to begin felting the other side. 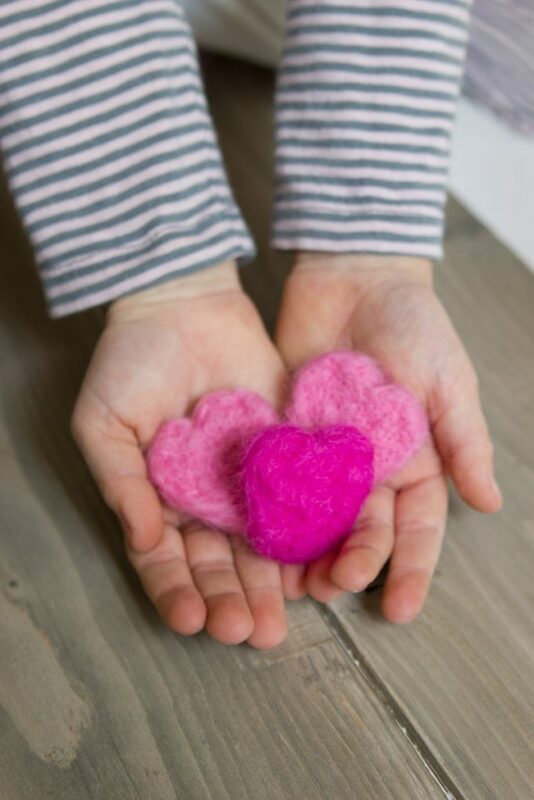 Continue working on each side of the heart until the wool becomes firm and you can feel that it is more difficult to press the needle through the wool. . When you remove the wool from the cookie cutter, it should hold its shape and be firm, not spongy. 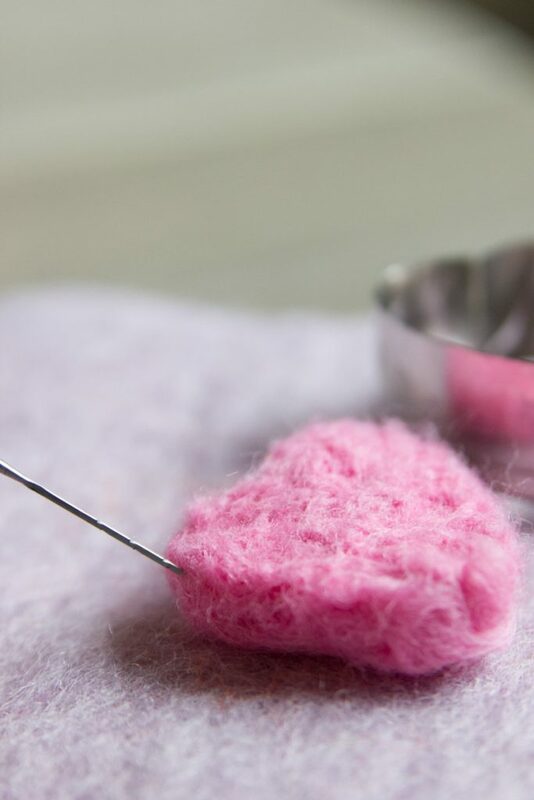 Use the needle to carefully touch up any of the edges where wool is still wispy. And that’s it! 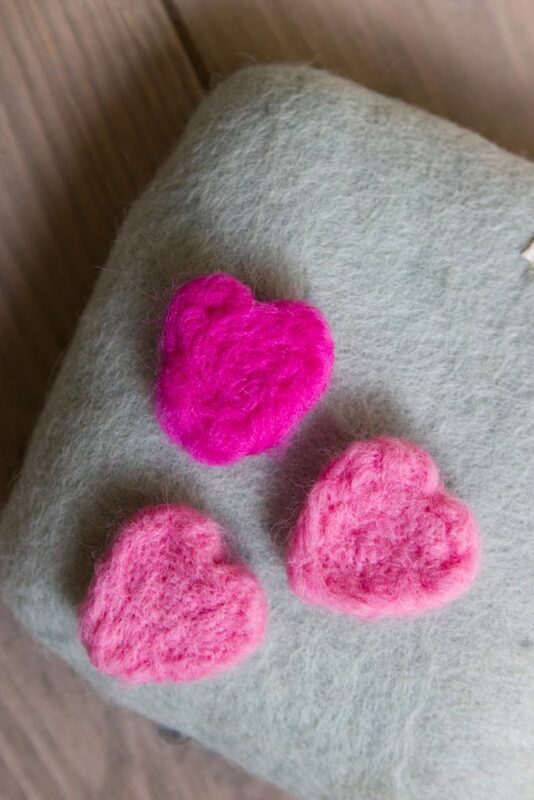 Your needle felted hearts are an adorable Valentine’s gift or decoration and can be used in so many ways. We have plans to make a garland and little ornaments for our nature table. In our house we love storytelling. We’ve been inspired by many of the aspects of a Waldorf education including using stories to teach lessons. Needle felting obviously uses a very sharp needle. It’s a handicraft that is great for children, but it needs to be done supervised, and they need to exercise great care in using the needle to create their art. 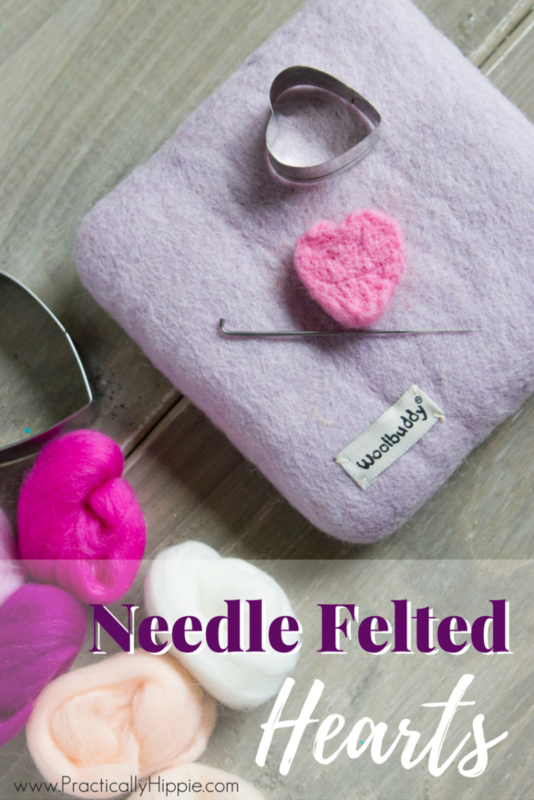 Instead of bringing out all the supplies and scaring the children with all sorts of warnings and directives about how to needle felt, a story is a gentle way to build excitement, introduce the handicraft, and get some of the safety warnings out of the way. I’ve adapted a story from one of my favorite resources for children’s stories to tell aloud Tell Me A Story. Grandmother’s Heart is a story perfect for Valentine’s Day, and will delight young children up to about age 8. See me tell the story to my 6 year old here or scroll down to the bottom of the post to download a PDF copy. I told a similar story at our homeschool co-op where we needle felted for the first time. My 6yo was able to make this adorable heart wand without any direction and minimal assistance from me. I love how it turned out!